The U.S. Environmental Protection Agency (EPA) has spent the last decade considering revisions to its hazardous waste management regulations (issued under federal laws generally referred to as the Resource Conservation and Recovery Act (RCRA)), exploring opportunities to clarify and simplify the text of the regulations and the actions necessary for compliance. In September, EPA published substantial regulatory revisions (which EPA entitles collectively as the Hazardous Waste Generator Improvements Rule) in the Federal Register; comments were due by December 24, after which EPA will decide whether to finalize the changes. EPA calculates that these proposals will include more than 60 changes to specific requirements, and more than 30 additional technical clarifications and corrections. These revisions would clarify some existing provisions, remove some longstanding requirements, and also add some additional new requirements. Some requirements apply to nearly all generators, while others are targeted at one or more of three volume-based tiers. Allow multi-facility entities to consolidate wastes from a VSQG facility to large quantity generator (LQG) facility for management. Define “episodic waste” generation provisions and management standards, which can be used once per year without triggering a higher level of regulation (e.g., from VSQG to SQG/LQG, or SQG to LQG). Revise and clarify requirements for LQGs’ hazardous waste contingency plans. Expand and clarify requirements to maintain records of hazardous waste determinations. Revise and clarify labeling requirements. Revise and clarify satellite accumulation requirements. Make dozens of organizational and editorial revisions “to make them more user-friendly and thus improve their usability by the regulated community,” by consolidating most basic generator requirements in an expanded 40 CFR part 262, conforming other sections (including requirements applicable to transporters, recyclers, and treatment, storage and disposal (TSD) facilities), and updating/correcting text. Many states are formally authorized (delegated) by EPA to administer RCRA requirements, and some have additional state provisions. Authorized states will be required to adopt those provisions that are more stringent than the state’s existing generator regulations in order to retain their authorized status. However, these provisions of the rule will not become effective in states authorized for the RCRA program until states have adopted the rule. Authorized states will not be required to adopt those provisions of the rule that are less stringent than the current hazardous waste regulations. This is the first of two blogs discussing these proposals revisions in more detail. This blog describes important revisions, some of which apply to all generators, and others targeted at VSQGs, SQGs, or LQGs. The second of these blogs will recompile the revisions separately for VSQGs, SQGs and LQGs so a generator can focus on proposals relevant to its own activities. How is EPA Proposing to Define and Regulate “Episodic Waste Generation”? Have a RCRA identification number, or obtain one (use EPA Form 8700-12). Notify EPA of the event, 30 days before a planned event or within 24 hours after an unplanned event (Form 8700-12). Accumulate episodic waste onsite in compliance with applicable containment standards. Label episodic waste containers (including identification as “Episodic Hazardous Waste”). Use hazardous waste manifest and transporter to send episodic waste to RCRA-designated facility (TSD facility or recycler) within 45 days. Maintain required records for 3 years. These provisions are intended to clarify that a generator’s status as LQG/SQG/VSQG is based on routine activities, not on occasional events, but also to ensure adequate and prompt management of non-routine “episodic” hazardous wastes. How Would Satellite Accumulation Requirements Change? Explicitly require SAAs to comply with limitations on incompatible wastes. Provide limited exceptions to the requirement to keep containers closed at all times. Confirm that the three days allowed to move a container from SAA to central accumulation means three consecutive calendar days, not three business days. Provide a maximum weight for the accumulation of AHW in SAAs, in addition to maximum volume (i.e., 1 quart or 1 kg)). Reword the regulations for when the maximum volume or weight is exceeded. Rescind a guidance memo allowing SAA accumulation of reactive (D003) hazardous waste away from the point of generation. Provide examples in the preamble to clarify the term ‘‘under the control of the operator’’. How Would Contingency Plan Requirements Change? Describe arrangements with local police and fire departments, hospitals, state and local emergency response teams, and any contractors who would be involved in emergency response. List facility person(s) qualified to act as emergency coordinator, capable of providing cooperation and information to agency responders and authorized to commit generator's resources to response and cleanup. List all emergency equipment at the facility, and locations where equipment is stored. Provide evacuation plan for facility personnel (if hazardous waste emergency could require evacuation), including emergency signals and evacuation routes. Describe emergency procedures the emergency coordinator will implement during an emergency. These include onsite and offsite notifications, assessment of incident, procedures for emergency and post-emergency activities. EPA is proposing to revise certain provisions, and to add a requirement that a generator submit an executive summary of its contingency plan to the Local Emergency Planning Committee or other appropriate local agency (for generators that first become subject to these rules at least 6 months after the proposal becomes effective). The executive summary would provide specified information EPA considers most important to emergency response agencies. The proposal would also require the generator to document that it has an agreement in place with local emergency responders. 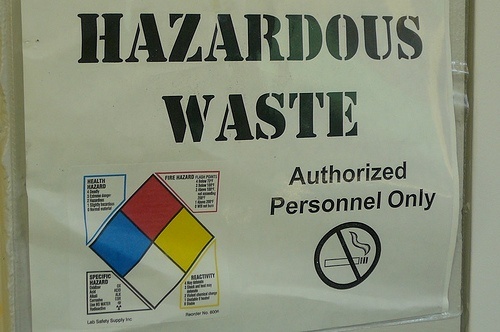 What Additional Documentation Requirements Would Apply to Hazardous Waste Determinations? RCRA requires a generator to evaluate its wastes and make determinations of which are hazardous wastes. EPA’s rules presently require generators to document determinations that a waste is hazardous, but do not presently require documentation of a determination that a waste is not hazardous. EPA asserts that up to 30% of determinations of nonhazardous status are incorrect, and is proposing to require SQGs and LQGs to create and retain documentation of those determinations as well. EPA is also clarifying standards for such determinations. How Would Labeling Requirements Be Enhanced? EPA’s labeling and marking requirements presently apply explicitly to tanks and other containers, but not to drip pads or containment buildings used to accumulate hazardous waste. EPA is proposing to revise requirements for LQGs to cover all these units. What Additional Flexibility Would Apply to Accumulation of Ignitable and Reactive Wastes? EPA rules require that containers holding ignitable or reactive hazardous wastes be placed at least 15 meters (50 feet) from the site's property line. EPA expresses a concern that some generators, such as those in urban areas, may find it difficult to meet these requirements. To add flexibility, EPA is proposing to allow generators to apply for a waiver from this requirement from their local fire department or emergency response organization, and if approved, maintain documentation of that agreement. …next time: summarizing proposed changes by generator category, for CESQGs/VSQGs, SQGs, and LQGs.